If running was just about putting in the miles, you’d stick to the treadmill, right? But if you find extra wind in your sails by pounding out the distance while taking in your surroundings, then heading outside is where it’s at. 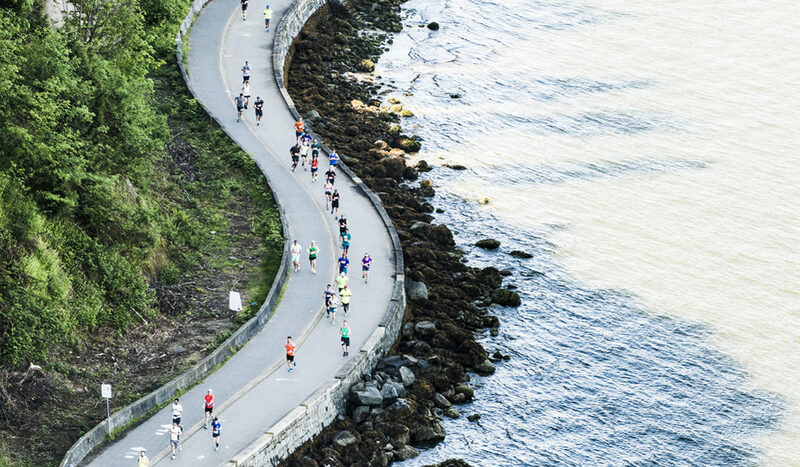 The BMO Vancouver Marathon boasts one of the most scenic routes on the planet (the official website says that it’s “so beautiful you’ll wish it was longer,” though we’re not sure that’s *quite* true…) and is also a qualifier for the legendary Boston Marathon. The course starts up at Queen Elizabeth Park, the highest point in the city, before heading out to the University of British Columbia campus, then back east along the waterfront. After running over the Burrard Street Bridge, the route sticks to the seawall, navigating around Stanley Park before hitting the finish line downtown. Water! Mountains! Nature! You’ll be in the middle of it all. Along with the full 42.2 km marathon, you can also choose to run the half-marathon distance, an 8 km course, or a 2.5 km Stanley Park loop for the kiddos. For those that want to tackle the course with their squad, there’s even a relay version of the marathon for groups of four. Planning on heading to our city to run the BMO Vancouver Marathon on May 5? Register online, then search our site for some great rates.